HandUp Global Goods (HUGG) works with teen orphans in Haiti by providing them with sustainable employment, opportunities to learn about financial literacy, and finding guidance through spiritual development. Through this process HUGG is working to provide young Haitians with a "Hand Up" instead of a handout, encouraging these young individuals to be able to provide for themselves. The journey began when husband and wife, Natul and Daniel began fostering kids in their Texas home. Through out this process they noticed a huge need of kids searching for homes. The couple started an orphan care group in their community which grew through their church. These compassionate heroes wanted to encourage other people in their community to welcome foster children into their homes. "If we could do it, so could they," Natul stated. During this time, Daniel was able to travel to Haiti where he came across a group of young boys creating jewelry as a means to survive. This experience moved the couple to expand their orphan care efforts to focus on local AND global initiatives. In 2015, Natul decided to found HandUp Global Goods (HUGG) to eliminate a life of handouts for Haitian teens transitioning out of orphanages by working to seek social and spiritual change together. HandUp Global Goods (HUGG) focuses on four principals: employment, financial literacy, spiritual development, and vocational training. The young men are taught jewelry making to further their skills and develop their work ethic. HUGG then pays the young men a fair wage to make the jewelry, allowing them to support themselves. However, HUGG goes the extra mile to ensure that their money is going to good use through a financial literacy program. While this program is still being developed, one of the ways they encourage financial literacy is through the rent expense. During the first year HandUp Global Goods paid for 100% of the young mens rent, during the second year HUGG covered 50% of the rent and the young men were expected to pay the other half, and during the third year the young men were responsible and able to pay 100% of their own rent. HandUp Global Goods also encourages the young men to find their sense of belonging through spiritual development through morning devotionals. HUGG has previously worked with two groups of young men and will soon be welcoming their third group of ten new trainees. HandUp Global Goods is hoping to train this group to work as consultants which will create leadership positions allowing these young men to go out and teach their skills to partnering organizations in Haiti. Through their initiatives of working with transitioning young men, HandUp Global Goods is addressing a lack of self respect from an upstream approach, allowing men to find dignity within themselves which encourages them to respect the women in the community too. Natul encourages consumers to learn more about the hands that make. She states, "It's all about empowering the people. Often time we think the problem is so big and we just shrug our shoulders. We want consumers to ask and think about the hands who make your products. Once you ask that, it’s hard to shake. These small purchase choices, they are not going to change the world overnight, but it will change the world for one person." One of the aspects I sincerely appreciate about HandUp Global Goods is how they work to sources as many of their materials from local organizations in Haiti which positively contributes to the Haitian economy. HandUp Global Goods are incredibly well made. I absolutely love the intricate detail in their products. The Sonje Necklace is made with quality leather and beautiful natural colored beads. I love the dream catcher bohemian vibe of this piece. 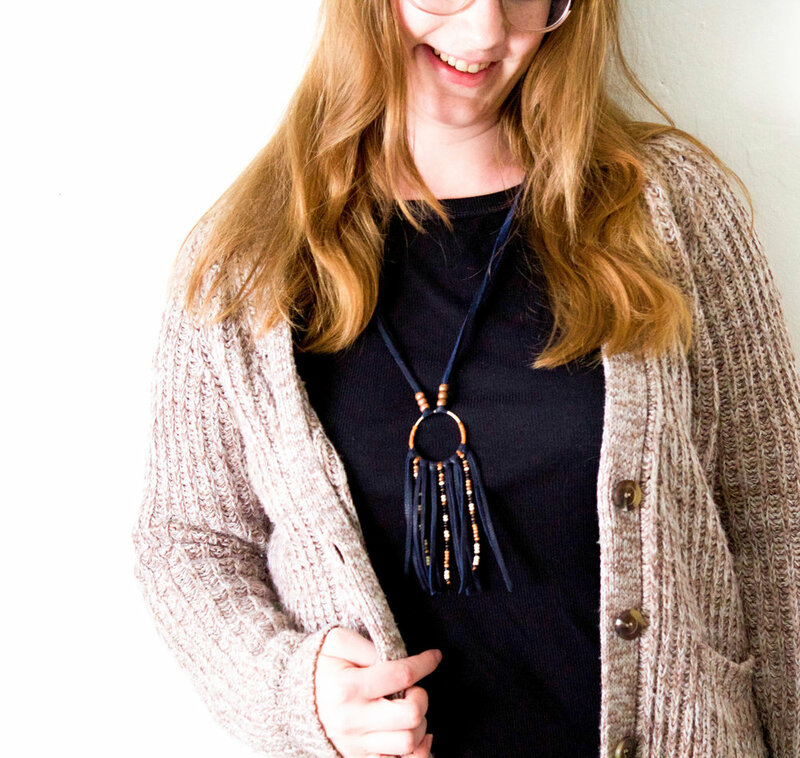 Paired with a cozy sweater, this necklace is perfect for fall. The weight of the wrap bracelets are perfect. They are strong and sturdy, I don't have to worry about snagging my bracelet on anything. The Akolad Choker is a fun accessory and easily adjustable for your comfort. The bright colors and beautiful work of these artisans makes these pieces the perfect accessories. I encourage you to check out Hand Up Global Goods!